We envision this product as a discreet, daily wearable for those with crowd anxiety disorders, personal space issues, or women subject to subtle harassment by unknowingly aggressive people. This product would be switched on continually throughout the day, and act as a social advocate of sorts, alerting others to their behavior in a subtle way without pressuring the user to do so themselves. A user scenario could be a young man with anxiety who wears the product as a lapel pin on his suit jacket. During a normal day at the office, whenever a colleague got uncomfortably close, the product would flash and alert them to slightly back away, at once restoring personal space for our young man and avoiding embarrassment for his colleague. This product would be marketed as a “smart” fashion accessory, and could be sold at premium menswear clothiers, women’s fashion boutiques, and department stores. We had some run-ins with the sensor not working properly as it was placed behind the transparent dome. Thus, we decided to sawed the front off. And it worked!! Work out a way to hide all of the wires and it would have a small battery pack encased with the Neopixel. How to design a form with the intention of a circuit board inside. We also learned to troubleshoot and try to fix the problems that came up along the way (both in coding and the process of making the casing and attaching all the parts together. Oomung’s experience: Every time the code was iterated upon to solve old problems, new ones arose. This experience reaffirmed the difficulty and importance of coding and bug-testing. The key element for me was understanding the use of arrays to generate an average ‘smooth’ input from the raw and glitchy analog input. Also, understanding the circuit board and electronic components helped in form development, wherein our design fit together all the pieces while maintaining our core sense of aesthetics. Late night protection wear on the back: warning people with bad intention that the wearer is aware they are there. Two weeks ago, the CANduit group proposed three concepts for sensing an undesired behavior or environment. Our four group members all belong to the North Classroom at SVA Products of Design, which is notoriously known for being the coldest of studios, and although cannot solve this temperature problem, we are choosing to bring attention to the drastic range of temperatures one experiences in the studio. To do this, we created a hanging lighting device that emits sound when the room’s temperature exceeds and dips below a particular degree. The device consists of a red and blue light, of which represent “warm” and “cold”. Warm temperatures trigger the red light to shine while Johnny Cash’s “Ring of Fire” plays for 10 seconds. Similarly, cold temperatures trigger the blue light to shine while “Cold Cold Cold” by Cage The Elephant plays for 10 seconds. To start our process, we explored how our temperature sensor worked when exposed to heat and ice. To add sound, we purchased a soundboard (Adafruit Audio FX Mini Sound Board – WAV/OGG Trigger – 2MB Flash) and amplifier (Adafruit Mono 2.5W Class D Audio Amplifier) This particular soundboard does not have any code, and works like a standard USB drive – you can drag and drop your files onto the soundboard. Soundboard, speaker, and LED setup. The LEDs were quite dim when we tried to light 6, so we decided to use only one red and one blue LED. 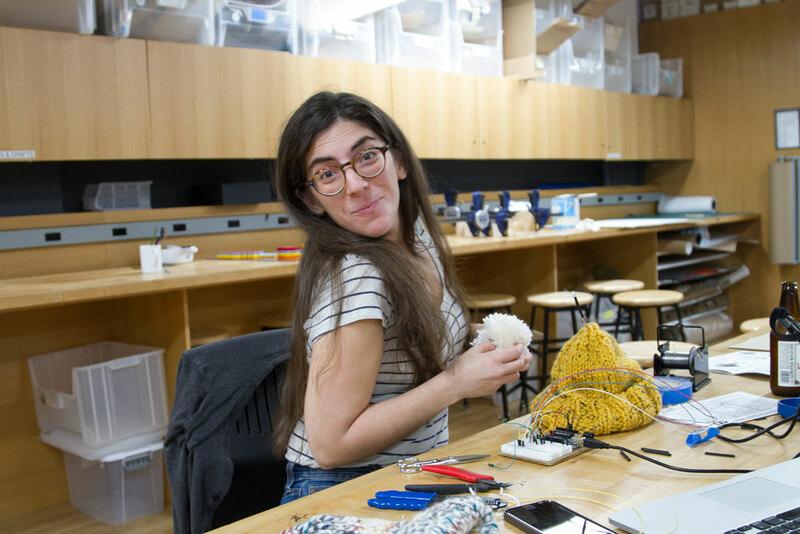 In order to hang our device with little mess, we used a tubed-netting fabric to keep our wires together. These wires will be soldered to each of our LEDs and to the speaker. Our Arduino board and other bulky parts will be mounted on a sheet of plexiglass, as to be concealed. LEDs will inhabit a small plastic sphere that will hang from the ceiling. The hanging cord will run from the LEDs, through the plexiglass mount, and along the wall until it reaches an outlet/power source. Currently, we are having a hard time completing our code in the way that we would like our system to work. Adjusting the temperature does trigger our songs to play, but in a loop. We would only like for our song to play only once, not continuously until the temperature is triggered in the opposite direction (hot –> cold). Because our DigitalWrite statements, the ones that trigger music to play, exist within our loop, once the trigger has started, the music is repeated. Despite telling our code to stop playing after one time, our trouble still lies in figuring out how to stop the music from playing after the audio clip has finished. Create a blog post for your final switch prototype including description, final photos and process photos to the course blog by 8pm this Wednesday. 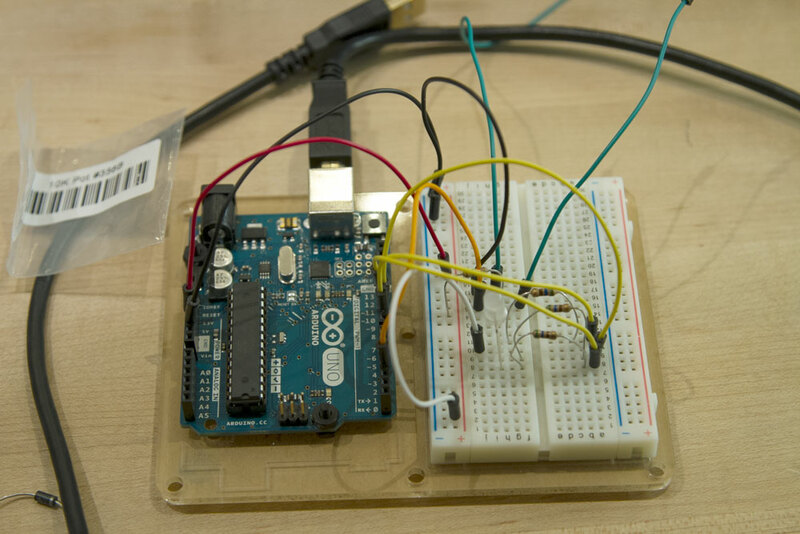 The final Arduino prototype does not need to: fit inside your model, be soldered or be miniaturised. The critique this Thursday will focus on the interaction between you and your switch. So focus your efforts on refining this! 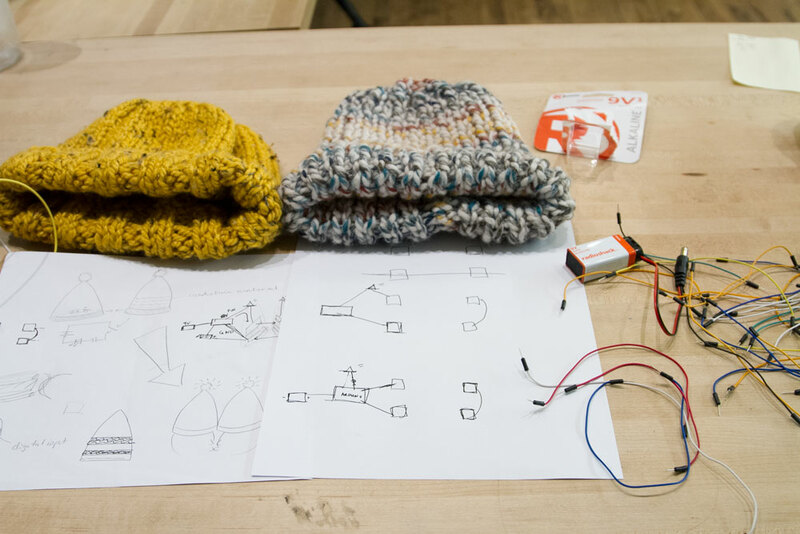 For my innovative switch project I knitted a pair of hats with conductive yarn. 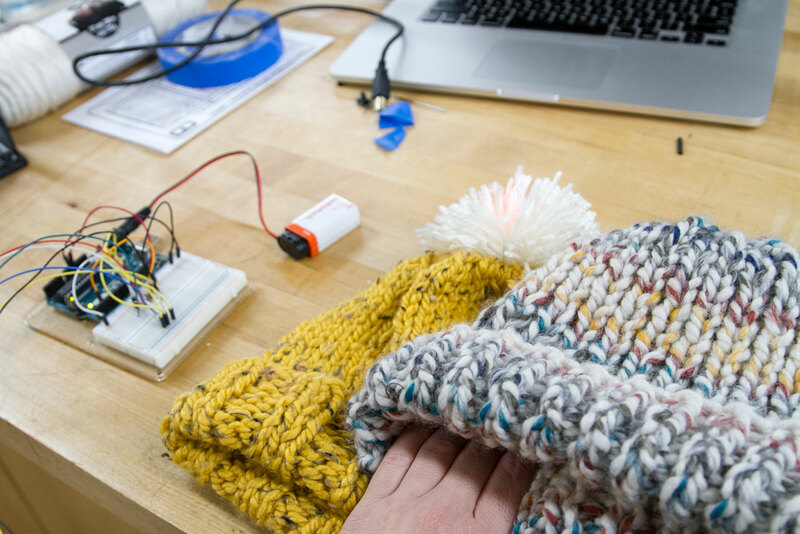 When the patches of conductive yarn in both hats touch, the arduino board sends a signal to the led to light up in a pattern of random colors. The blinking led signifies the wearers excitement about being nuzzled by their companion in the second hat. I was pleasantly surprised by how well the yarn worked despite how thin it is compared to the yarn weight I used. 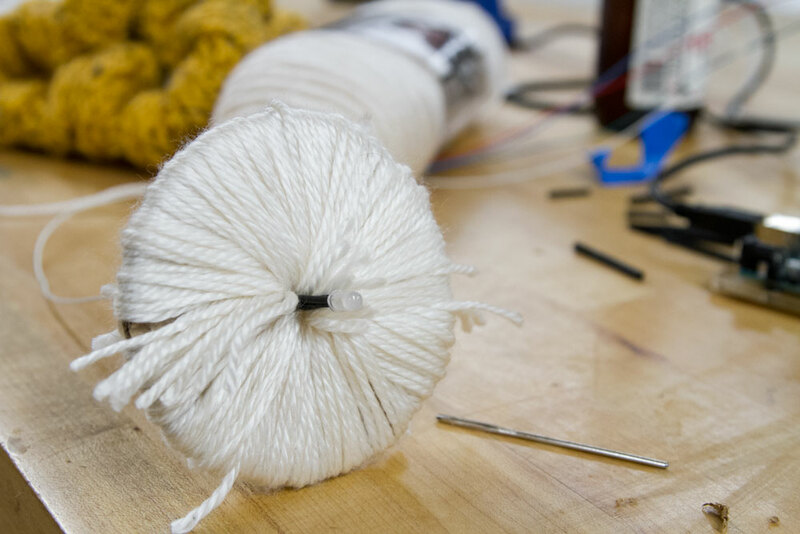 Were I to do the project from the beginning, I would have knitted both patches of the conductive yarn into the brim. As it is now, one patch of conductive yarn is in the brim while the second is on the crown of the head. This make contact between the four patches a bit unreliable. I’d also like to see how it looks with 2 – 4 more leds.